David H. Weinglass, ed., The Collected Letters of Henry Fuseli, reviewed by G.E. Bentley, Jr.
G.E. 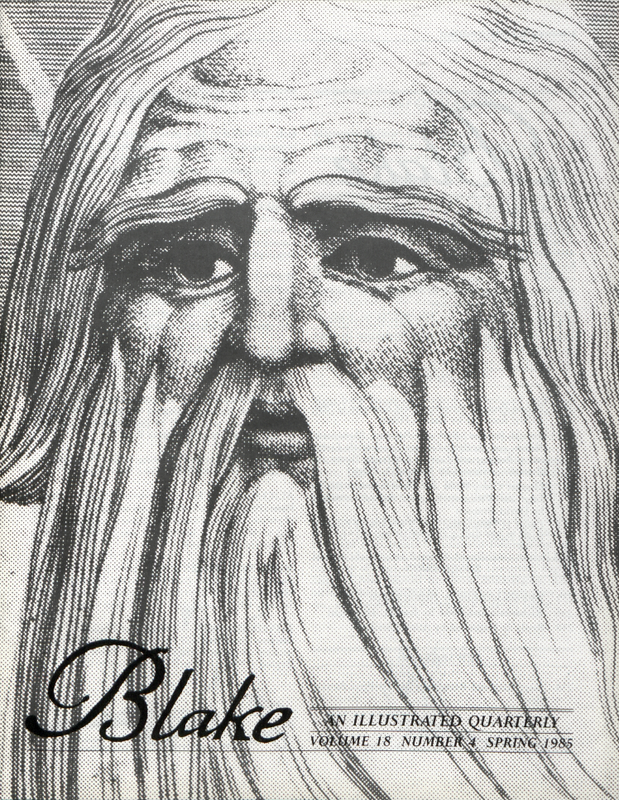 BENTLEY, JR., of the University of Toronto is preparing a Supplement to Blake Records (1969) for the Clarendon Press and completing books on F.J. Du Roveray, the Edwardes of Halifax, Thomas Macklin, and other illustrated-book publishers of the 1790s. ROBERT N. ESSICK, Professor of English, University of California, Riverside, is the author of William Blake, Printmaker and The Separate Plates of William Blake: A Catalogue. He is now writing a study of Blake and the language of Adam. WAYNE GLAUSSER, Assistant Professor of English, DePauw University, has written about Blake, Wordsworth, and contemporary American fiction. He has most recently written an essay interpreting Blake’s letters in and around the Felpham period. JEAN H. HAGSTRUM is currently a Senior Mellon Fellow at the National Humanities Center, Research Triangle Park, North Carolina. NELSON HILTON, Blake’s review editor, is also co-editor (with Thomas A. Vogler) of Unnam’d Forms: Blake and Textuality, which will be published later this year by the University of California Press. PAUL MANN, currently living in San Francisco, is a member of the Santa Cruz Blake Study Group. ALICIA OSTRIKER is the editor of Blake’s Complete Poems (Penguin). Two of her recent works include a book of poems, A Woman Under the Surface (Princeton, 1982), and a collection of her critical essays, Writing Like a Woman (Michigan, 1983). MORTON D. PALEY’s most recent book is The Continuing City: William Blake’s Jerusalem (Oxford, 1983). His study of apocalyptic art in Britain, The Apocalyptic Sublime, will be published by Yale next year. DAVID SIMPSON is Professor of English at Northwestern University, and the author of various books and articles on Romanticism. His The Politics of American English, 1776-1850 will appear in early 1986.